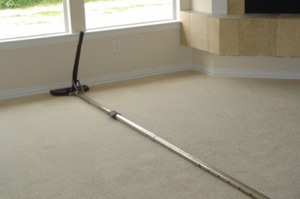 Carpet Stretching | Tacoma Carpet Cleaners | Carpet Pros, Inc. Carpet stretching is typically employed when flooring is starting to ripple or bunch up in the home. Small ripples are not usually caused by normal wear, but may occur when sliding around heavy furniture or when a floor is subjected to a great deal of foot traffic. Mistakes during installation or manufacturing may also result in small flaws like these appearing. While slight rippling may not seem like a major cause for concern, it will result in more extensive rippling if it is not dealt with immediately. If not repaired soon enough, the flooring may need to be replaced completely. Trust the experts at Carpet Pros, Inc. to handle your needs. Replacement, though, is almost never required when minor rippling shows up. Carpet stretching can solve the vast majority of these issues. The only time the flooring may need to be replaced is if it is installed or manufactured poorly. For instance, if the company that sells the carpet matches up the wrong padding and carpet piles together, replacement of the pad and relaying may be required. If rippling is caused by normal wear or minor defects, this form of repair is usually all that’s needed. In general, carpet stretching is an easy repair task that the qualified technicians at Carpet Pros, Inc. can perform. It consists of pulling up the ends of the flooring and stretching it until it is taut. Once it is pulled out, our technician will cut away any excess and put it back in place. Our experienced professionals will then secure it so that it resists future relaxation. This process can repair slight rippling or extensive bunching, as long as there are no other major repairs needed. If you are looking for a Tacoma carpet cleaning company, then please call 253-460-5960.